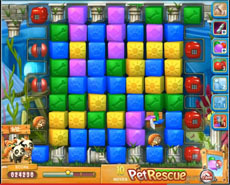 The strategy in pet rescue level 443 is simple. The balloon booster is your best ally in order to pass the level. Activate it as more often as you can, clearing as larger cluster of blocks as you can and use it immediattely either to rescue some pets, or to release a great number of pets from their pet boxes from the first or the last column. The forty moves are really enough to achieve the target of the level. Still Stuck on level 443? Why don’t you get a few minutes to carefully study the video below? I dont know if this would help but I play with tablet and found out that no matter how big of cluster you play didnt muchhelp to see pet box on the first of last column. The trick for me was try to clear the box on the first and last column to make room for pet box to fall down. The pet thatfall in the middle of screen are not enought to get to required amount . Then left just one colour to blast all at once and let the pet fall to the ground. I just got 4 stars at 40000 up point today.